Make wrapping presents quick and easy with these durable, one-of-a-kind gift bags. Featuring 217 unique designs, you'll love handing these bags out as much as people will love receiving them. These bags are sure to be a hit. Perfect for hostesses, housewarmings, wedding receptions and everyday. 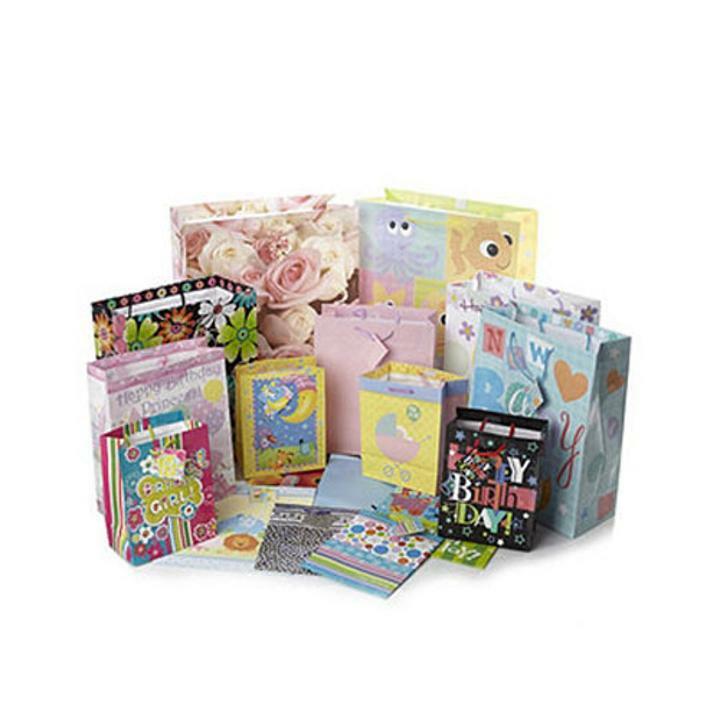 Pack contains 217 gift bags in assorted styles and sizes. Pack contains 1 wine, 8 XS or gift card size, 34 small, 29 medium, 98 large, 9 jumbo, 3 superwide, 29 giant and 5 super giant bags. Styles include solids colors, holographic, Christmas, birthday, baby, Valentines, everyday, baptism and more. ********Some bags may be dusty and need to be wiped down with a dust cloth****** With a selection this large you may never need to buy gift bags again! L: 13.0 in. W: 10.0 in. H: 0.25 in.